The Iranian Computer Emergency Response Team (MAHER) claims to have discovered a new targeted malware attack attacking the country, which it has dubbed Flamer. More info emerging -- this time from the CrySyS Lab, who name it "sKyWIper". PDF contains the hashes for the malware components as well. They just picked hashs from crysys right ? Last edited by Xylitol on Mon May 28, 2012 2:00 pm, edited 1 time in total. frame4-mdpro wrote: More info emerging -- this time from the CrySyS Lab, who name it "sKyWIper". Really great analysis! Seems Kaspersky, Symantec just copy-paste from it. 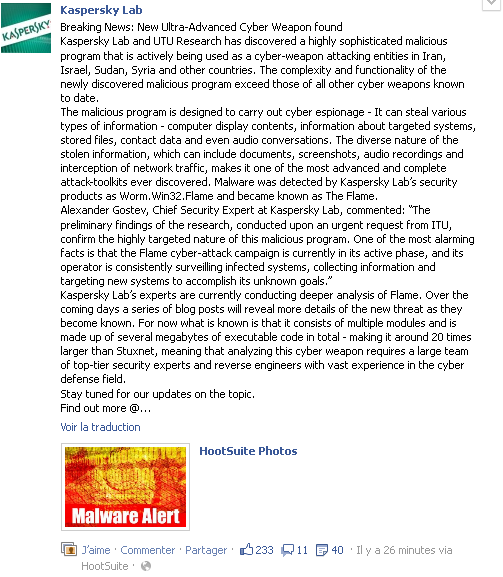 Does not really matter now was it collaboration or copy-past :) Pionner title goes to Kaspersky.